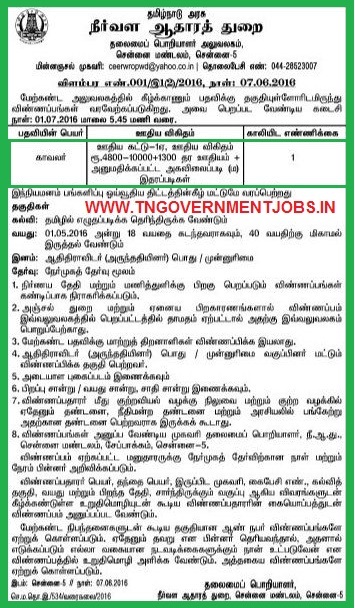 Watchman (Male) - 1 Post for SC Arunthathiyar Quota (Priority) - Basic Pay 4800 Grade Pay 1300 in Pay Band I-A category - No formal education required ; read and write in tamil - Age minimum 18 years, maximum 40 years. Cut off date for age calculation is 01.05.2016. Interested and eligible candidates may forward their application form alongwith all necessary documents duly self attested to the following address or before the Last date 01.07. 2016.